Basel, the third largest city in Switzerland after Zurich and Geneva, with approximately 170,000 residents, is located in the extreme north-west of Switzerland on both sides of the Rhine in the tripoint of Germany, Switzerland and France. Basel is also the second most densely populated city in Switzerland after Geneva. 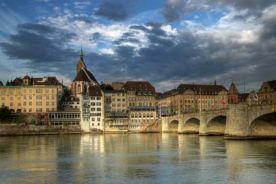 Thus, the average number of residents per square kilometre of Basel is 7301 and the city has a rather small area measuring about 23 square kilometres. Basel is divided into Grossbasel on the left riverside of the Rhine and Kleinbasel on the right riverside. The city in the German speaking region of Switzerland is the headquarters of the Swiss College and the University of Basel. It is also the centre of the capital markets, trade fairs and congresses and the centre of the chemical and pharmaceutical industries. Basel’s monastery is the city’s most famous landmark. As a location of healthcare, Basel has a total of 12 hospitals with approximately 2100 hospital beds. Practically 59,500 patients receive medical treatment in this city every year. Moreover, there are about 690 doctors, 170 dentists, 420 physiotherapists and 70 pharmacists in Basel.